National Geographic is well known for its stunning images, consistently shining new light on far flung places and giving everyone serious wanderlust. Whether you’re aware of it or not, you’ll already be familiar with some of their work. They pretty much set the benchmark of viral content when the internet was but a baby, and now they’re setting social media alight with a captivating image that effects all of our futures. Photo and words by @JustinHofman (Justin Hofman) | This is a photo that I wish didn’t exist, but now that it does, I want everyone to see it. What started as an opportunity to photograph a cute little sea horse turned into one of frustration and sadness as the incoming tide brought with it countless pieces of trash and sewage. This sea horse drifts with the trash day in and day out as it rides the currents that flow along the Indonesian archipelago. This photo serves as an allegory for the current and future state of our oceans. What sort of future are we creating? How can your actions shape our planet? ____________ Entertainer and activist Zooey Deschanel (@zooeydeschanel), co-founder of the Farm Project, is guest curating the @natgeo feed today as we launch Planet or Plastic? (#PlanetorPlastic), a multiyear effort to raise awareness about the global plastic crisis. Check back throughout the day to see Zooey’s selection of powerful images related to ocean plastics and the threat they pose to the environment. 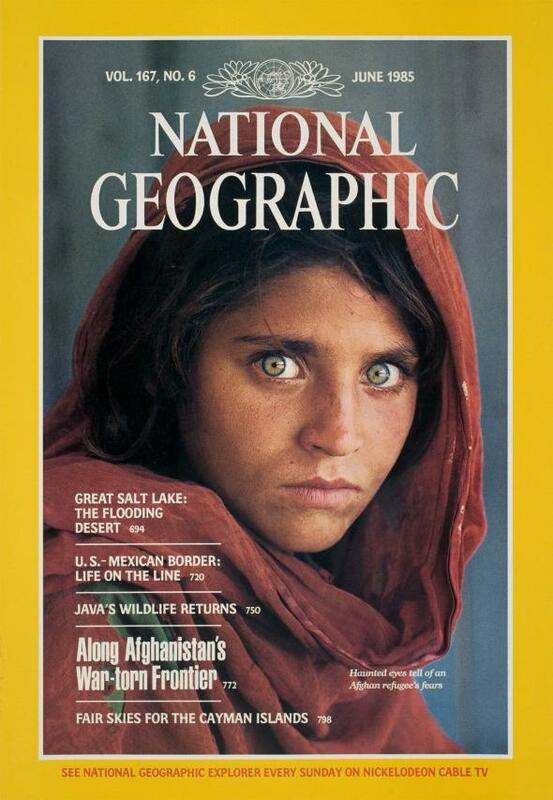 That’s what National Geographic have always been good at, telling a whole story in a single, striking image which stays with you long after you’ve turned the page. Their latest cover, for the June 2018 edition, is no different. In fact, it’s probably one of their best. 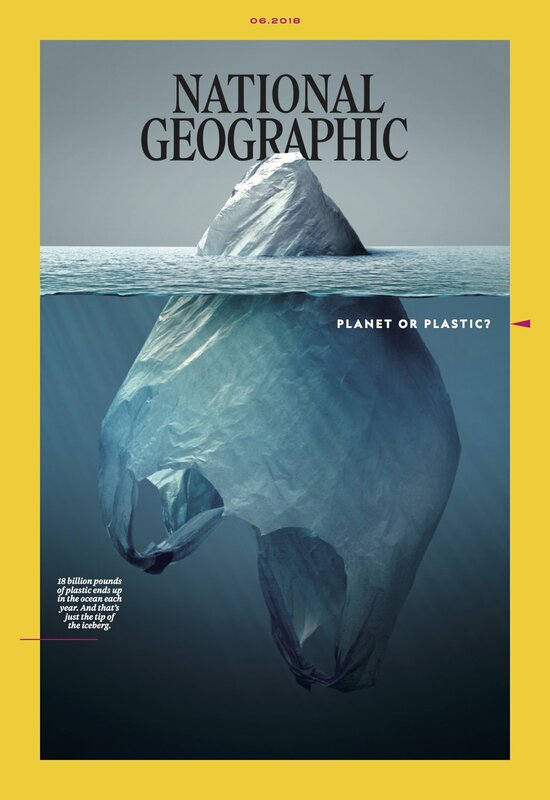 As part of the magazine’s ‘Planet or Plastic?’ initiative, the new image is a stark reminder of the danger’s we’re facing due to plastic pollution. Created by Mexican artist Jorge Gamboa, the hyper-realistic photo-illustration suggests plastic waste in the ocean is just a small part of the problem. 18 billion pounds of plastic end up in the ocean each year. And that’s just the tip of the iceberg. While the message may be a little on-the-nose, it’s an undeniably effective reminder of what the planet is going through at the moment, and what needs to be done to tackle the issue. OK. Jorge Gamboa deserves an award for this. This one stopped me in my tracks. It’s brilliant. This one stopped me in my tracks. It's brilliant. Starting with this June issue, we’ve gotten rid of the plastic wrapper [around the magazine] and replaced it with paper. As Mashable reports, photographer Jorge Gamboa had originally submitted the artwork, entitled Iceberg Plástico to Bolivia’s Biennial of Poster 2017, where it won first place in the political and social posters category. The image is now set to become a lot more well known as the millions of National Geographic followers worldwide will see it. If you don’t already follow National Geographic on Instagram, I would highly recommend giving them a follow. Their photos are consistently beautiful and eye-opening, and are sure to offer something different on your usual feed. Let’s hope as many people as possible see the image and are encouraged to do their bit to help clean up the planet.